Apologies again for the somewhat light blogging today. I’m en route to Georgia tonight to be with my mother and stepfather, and someone that you may remember from Washington Monthly posts in the past, Ryan Cooper, will be stepping in tomorrow, with (God willing) an occasional post from me. * Jury in John Edwards headed for sixth day of delberations, apparently now focusing on late donor Fred Baron instead of 101-year-old donor Bunny Mellon. * Alam Abramowitz looks at past presidents and current models, and suggests looking at late performance of economy and late job approval rates before making predictions. 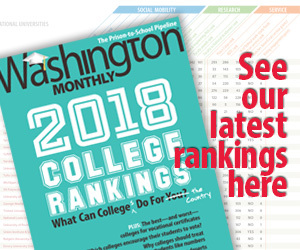 * At College Guide, Daniel Luzer discusses Sarah Lawrence College’s walk-back of its earlier decision not to look at SAT scores. * TPM’s Sara Libby analyzes exceptional impact of redistricting on women from both parties. * Also at TPM, Josh Marshall hears crickets in Wisconsin, at least for recall backers. Hope it’s calm before storm. * Big Bang Theory’s Jim Parsons officially comes out as gay. Sheldon’s mom might be upset, but the rest of us are fine with it. Gotta run for the shuttle for the long ride to long flight from SFO.